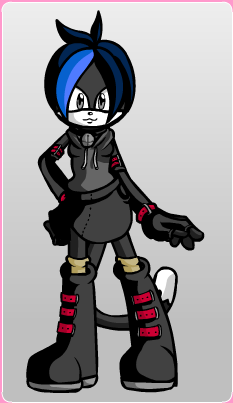 Character was inspired to be made based on the Total Drama character but chose to make her an independant character. Bio: Gwen is a goth in style but not personality, she is happy and is willing to party, she doesn't focus on social standings but she would like to be able to do good, she is normally invited to parties due to her body which is never told and is a quick to get drunk which results in her getting amazingaly turned on. She knows about that but doesn't stop it as it makes her very popular with guys.